Thank you for submitting your request through our website. We will be following up with you right away. If you have any questions in the interim, please feel free to e-mail us at sales@taylorcommunications.com or call us at (877) 733-3552. Taylor Communications takes great pride in our ability to create economic and business value for our customers and supplier partners. To achieve this, we strategically align our organization with industry-leading suppliers who share our commitment to always finding “a better way” to help us serve our customers and where applicable, support our diversity programs. In doing so, we create relationships that are designed to enhance our value to customers while adding strength to our company and our supplier partner organizations. Taylor Communications is committed to doing business the right way and upholding ethical practices across our organization. We expect the same from our supplier partners. Our Code of Conduct provides an overview of our expectations from all parties. In addition, we support the California Transparency in Supply Chains Act. Dan Dunn, regional vice president for Taylor Healthcare, was named 2017 Ohio Minority Supplier Development Council Advocate of the Year. 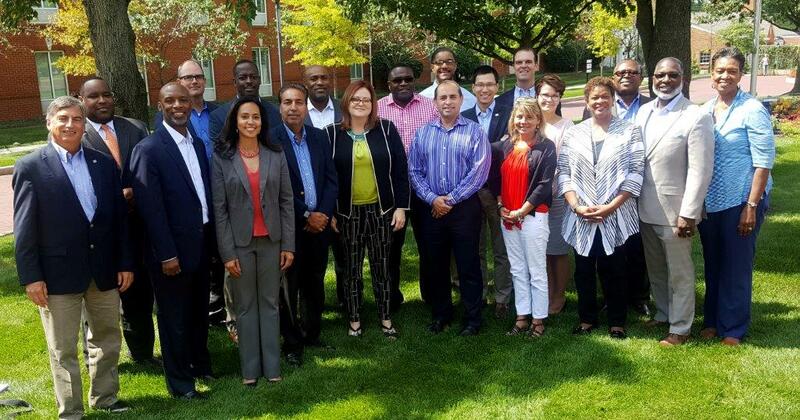 Dan (far left) is pictured with his colleagues from the Ohio Minority Supplier Development Council here. Taylor Communications has a long-standing commitment to utilizing a diverse supplier base to provide the products and service value our customers require. We are dedicated to a strong Supplier Diversity Program as we believe it is not only good business, but it helps build minority and women-owned organizations and supports the communities in which they are located. Taylor Communications is a proud corporate member of two local affiliates of the National Minority Supplier Development Council. To be considered a part of our program, you must register with the Taylor Communications Corporate Procurement Office. To register, please submit any literature on your company and the products or services you offer along with your certification as a M/WBE. We accept certifications from any national, state or local government agency, the National Minority Supplier Development Council and its affiliates, or the Women Business Enterprise National Council and its affiliates. Once you are registered with Taylor Communications, we will maintain your information in our data base that is available to any individual involved in making sourcing decisions within our company. Within Taylor Communications, contracts are awarded on a competitive basis. Being registered with our company is not a guarantee of business but it is a major step in the process. It is our goal to have a significant percentage of our purchases made from M/WBEs however contracts will not be awarded solely on the basis of being registered as a M/WBE. Clients trust Taylor Communications to meet the complex challenges of communicating in today’s omnichannel world. Our experts leverage technology across the industry’s broadest network to create solutions that improve customer experience, drive efficiencies and grow revenue. © 2019 Taylor Communications. All Rights Reserved.